Receiving the fifth place across over 38,000 other companies in the Middle East, Europe and Africa, Cooper Fitch scored highly on the marketing content. 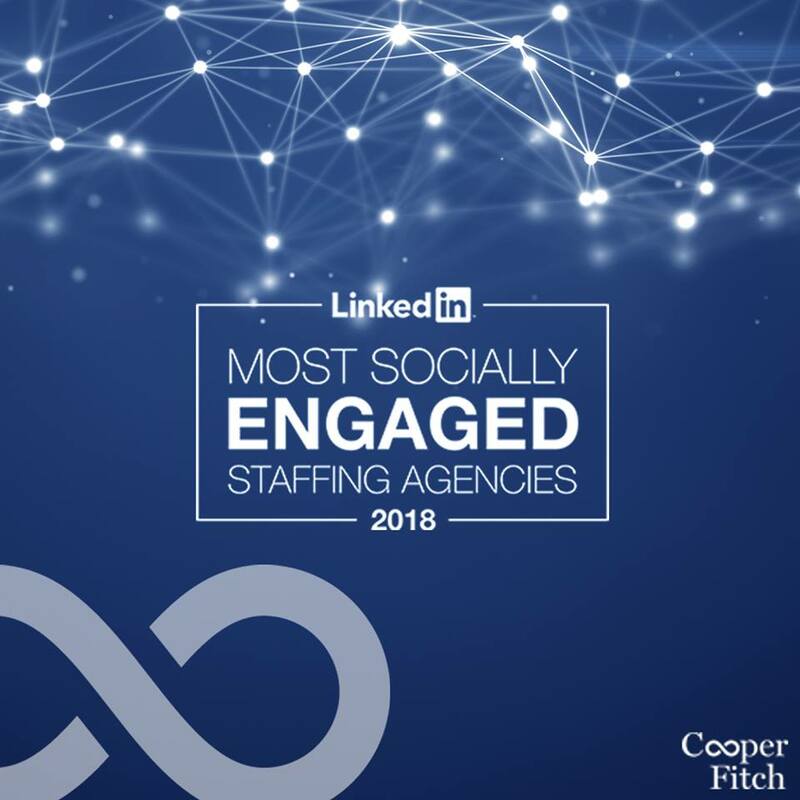 For the fourth year, LinkedIn announced The 2018 Most Socially Engaged Staffing Agencies on Wednesday, 16 October 2018. Cooper Fitch has been awarded fifth place in LinkedIn’s “World’s Most Socially Engaged Agency” list. Over 60,000 eligible search and staffing organisations were meticulously analysed. What truly set the winners apart was their ability to engage LinkedIn members through compelling company and employee activity. Receiving the fifth place across over 38,000 other companies in the Middle East, Europe and Africa, Cooper Fitch scored highly on the marketing content, audience size, engagement analytics such as comments, likes and shares as well as employee communication within their network on LinkedIn. With better awareness, follows greater consideration and intention to purchase our solutions. Research asserts that 90 percent of all marketing managers report that social media marketing has increased their business exposure while 66% of them commented saying that they have seen more leads. A recent research also asserted that social media is one of the main sources that are used when a client or a customer is looking for more information about a product brand or service. The digital platforms provide an inside look into the brand identity and culture without any required physical presence. Another research conducted by Kelley School of Business reported that a significant number of employees refrain from engaging with the brand they work for and choose to engage with the other employees instead which in return might damaging consequences for the firm and its brand. There is considerable evidence of the negative effects of refraining from engaging with your brand. These effects include a range of business outcomes such as decreased revenue, lowered costs, lower service-standards and decreased customer satisfaction.